I can’t wrap up another season without some huge thanks going out to the folks that make HFP Racing run so smooth, along with mentioning many other folks that make our job/lifestyle so much more enjoyable. God has truly blessed us with an amazingly talented crew. First off; the incredible HFP Racing staff & team that works so hard with so much passion each & every weekend. The heart and soul of HFP’s race weekend customer service, registration and volunteers…my amazing wife Jennifer (aka super mom). Her attention to detail and ability to articulate race scenarios to the staff and volunteers is unrivaled. This is the lady that USAT Hall of Famer, Jim Curl, called the smartest woman he’s ever worked with during the relaunch of the U.S. Triathlon Series in 1996. I am blessed to have Jennifer as my wife and co-worker. You can’t pull off 16 race weekends with each weekend hosting up to 8 events without a great operations team that can multi-task to the max!! HFP operations team is one of the best with veterans like Sandy Donald, HFP’s official swim course starter (and occasional race announcer) and John Sachs, HFP’s run course coordinator (along with myself) are cool cucumbers when the heat is on & always wear their many hats with pride. A great enhancement to our logistics team this year was Jason Sadler, HFP’s new bike course coordinator. Jason single handedly upgraded our bike courses with “OCD” attention to detail and course marking consistency. 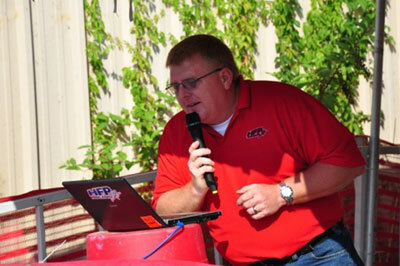 And lastly, the official voice of HFP Racing…Rich Fowler. Rich is hands down the most attentive person with regards to reaching out to our racers and finding out “just a little bit more about them” and then announcing it to the world when they cross the finish line. A lot of race announcers want the attention to be on them and for them to be the focal point in the race. Rich is the exact opposite and takes great pride in making YOU the focal point at the finish line. Traveling from his home in Findlay, Ohio to join us nearly every weekend, Rich usually arrives at the 11th hour after getting very little sleep as his priorities are his kids and their long list of activities. But Rich will be the first to tell you that HFP is also part of his extended family and he values you all very much. Read more about Rich’s story here. There are so many more of you, like Staicey Scholtz or Karen Mueller and her family, the Washburn family, the Phillips family, Dublin Boy Scout Troop 185 and many more that play equally important roles in making HFP Racing run smooth throughout the season….too many to properly acknowledge in this blog post. Please know that we thank you and appreciate you very much. Someone “really” famous once said “It takes a village”…well I always thought it should be “It takes a team”. Since the inception of our company, HFP Racing has sponsored a team. These are the guys and gals that are amazing stewards of the sport and are a joy to see toeing the starting line each weekend. Founding members, Curt Haywood and Mark Lemmon, not only provide the Team with class but are incredible personalities along with being my dear friends. 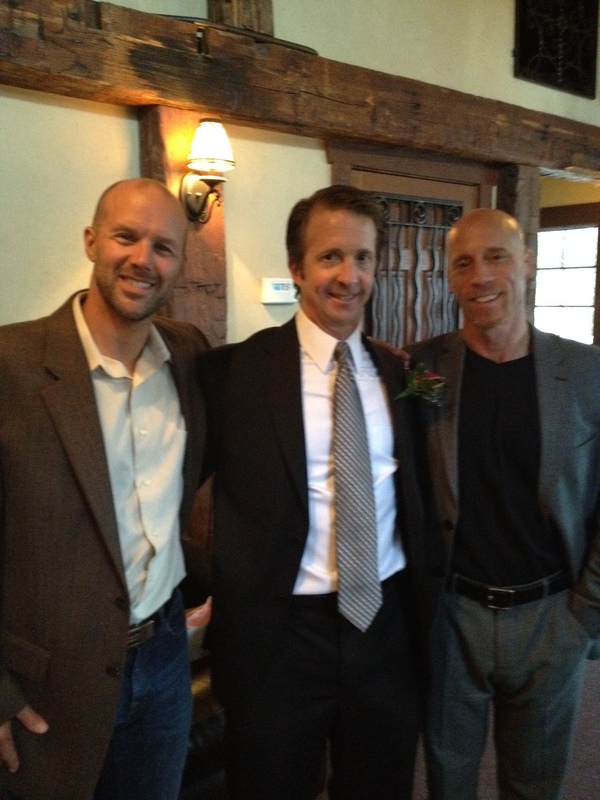 These are guys that are great sounding boards when HFP is pursuing a new event or looking at new ideas. Longtime teammates, Todd Ricketts and Ross Hartley, are a real inspiration to see how far they have come in their life and sporting careers (and how FAST they both are). 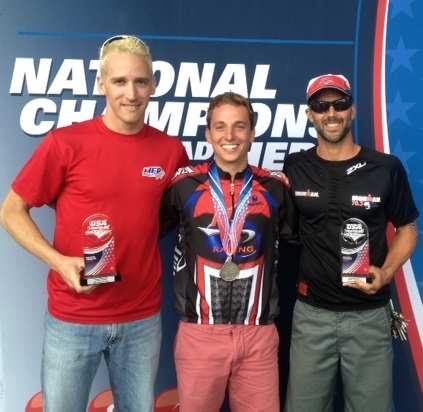 I had the good fortune to travel with them to Milwaukee this year for USAT Triathlon National Championships…one of the best trips of my life. 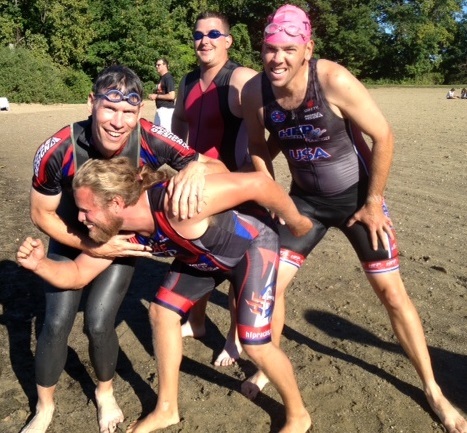 Then there are the likes of Randy Lehrer, Brian Barker, Don Cain, John Menzies, Roy Youngman, Fred Strong, Michael Boone, Michael Willetts, Ed Wheeler, Jimmy Little and Ray Schoomer (just to mention a few…there are many more) who are true gentlemen and statesman for the sport of multisport. Along with these gentlemen are some amazing ladies like Deb Wheeler, Holly Fiora, Georgetta Schoomer (battled breast cancer this year and became a SURVIVOR!! ), Cheryl Chaney & Deanna Kiesel that represent HFP with pride and class at every race. A great crop of new teammates brought in some much needed new blood to the team in 2013. 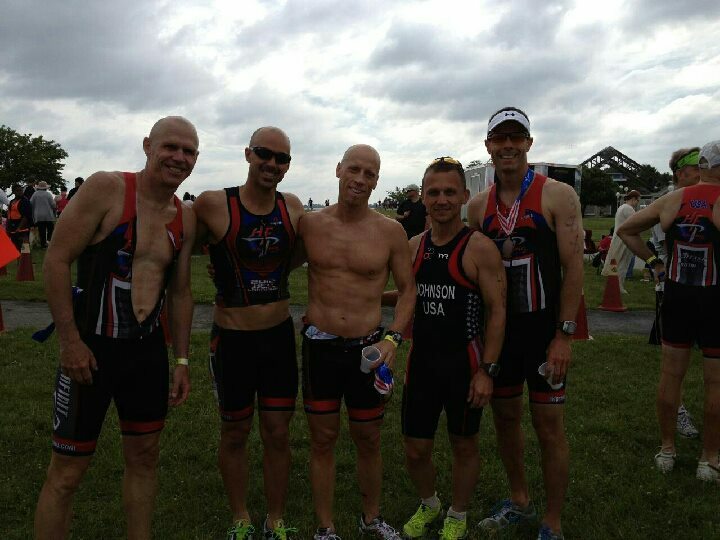 Guys like Craig Richardson, Neil Erst, Casey Kist, Paul Gigliotti, Dr. Thomas Carter added some great personality to the team. Thank you all for being part of Team HFP! The HFP Racing season closed with a record turnout of nearly 700 participants at the September 29 Deer Creek Fall Challenge. It was quite obvious that there was a feeling of gratitude in the air for getting one more chance to race before the 2013 season ended. It was magnified by the near perfect weather conditions on race day which lead to many personal PR’s and course records in almost every race distance. With the mini distance featured for the first time at the Deer Creek Fall Challenge, standards were set by Andrew Puckett (44:15) and Jackie Pfeiffer (4(03) in the triathlon and Matt Miller (1:00:32) and Haven Lochow (1:07:36) in the duathlon. Haven is just 13 years old and a daughter of our long time athletes, Steve and Amy Lochow! In the sprint race, course records fell with Ross Hartley (1:01:35) and Kat Briggs (1:12:34) winning the triathlon. 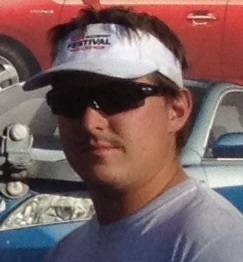 In the sprint duathlon, Evan Bayles (1:11:48) bested the 2012 mark by just 5 seconds. Fort Wayne’s, Zach Ruble set a new mark in the Olympic Triathlon of 2:02:26 and veteran Robyn Willams (2:23:25) set a new mark for the ladies. In the Olympic Duathlon, Nick Baker used the days best run splits to set a course record of 2:10:44. In the half iron triathlon, US Pro Tri member, Jim LaMastra put on a clinic and destroyed the course record by nearly 20 minutes in 4:08:53 to wrap up the weekend of course records. AND look forward to even more enhancements in 2014! We hope and pray for everyone to have a great off-season and look forward to an even more exciting 2014 race season! 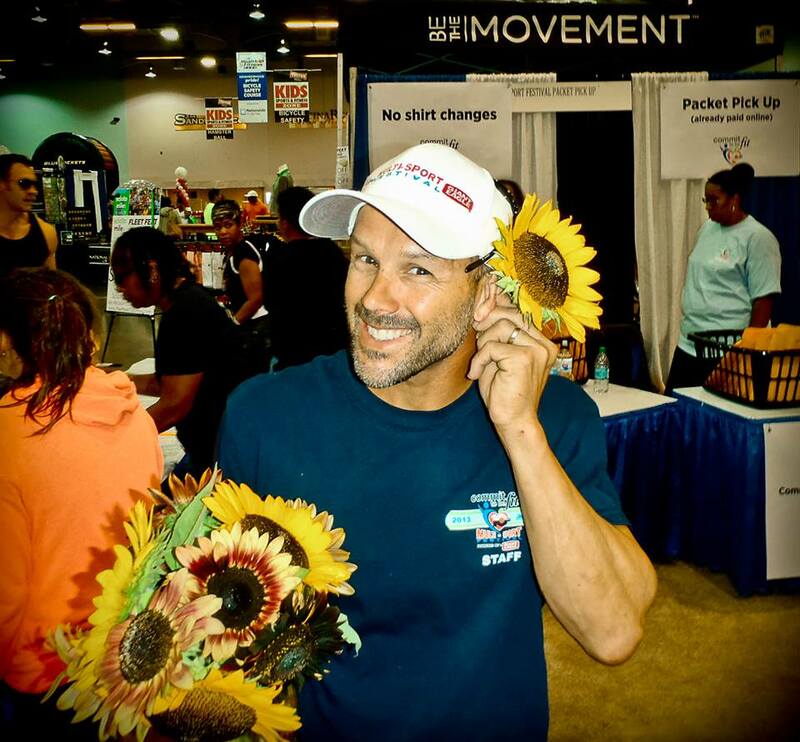 Fall 10-Week Session of “Don’t Sweat the Swim” begins October 1! Just a reminder that the Fall 10-Week Session of “Don’t Sweat the Swim” begins October 1! It’s a great avenue by which to work on your off season sport ORRRR, to train for the Swim Distance Challenge that will be held December 15! The Swim Distance Challenge is a fun way to do a lonnnnggg, swim and to see how far you’ve come over the 10 week period. The fall session takes place Oct 1-December 13. We will meet at 5:45 am-715 am twice a week for 90 minutes each session. The practices will have a strong emphasis on technique with the added component of conditioning. There are 2 basic levels, advanced who meet T and TH and novice who meet Wed/Fri. You can go to SWINWITHTRACY.COM to see which group fits your ability. If there are any questions or concerns please feel free to call! Thar’s how long you’ll have to wait until HFP’s next event on Saturday, April 12 2014 at Miami University…that’s a looong time to wait. You better get out for one last hit before you break out the Snuggie for the off-season. What are you waiting for? Perfect weather? Sunday forecast is for a low of 58 degrees and a high of 76!! You can’t get much better than that for late September. Water temperature is still in the low 70’s and will feel real warm on race morning. Participants, family, and friends will enjoy the spectator-friendly bike and run courses that are built for serious speed. Don’t miss the last official multisport event of the year on September 29, 2013 — the Deer Creek Fall Challenge. A distance for all ability levels; whether you’re getting ready for a fall half Ironman distance race or looking for a great course for your first triathlon, is the race for you. Deer Creek State Park is located just 20 miles southwest of Columbus off I-71 at the Mount Sterling exit. 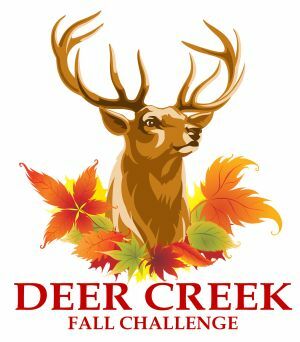 Join us in the last weekend of September at the Deer Creek Fall Challenge! 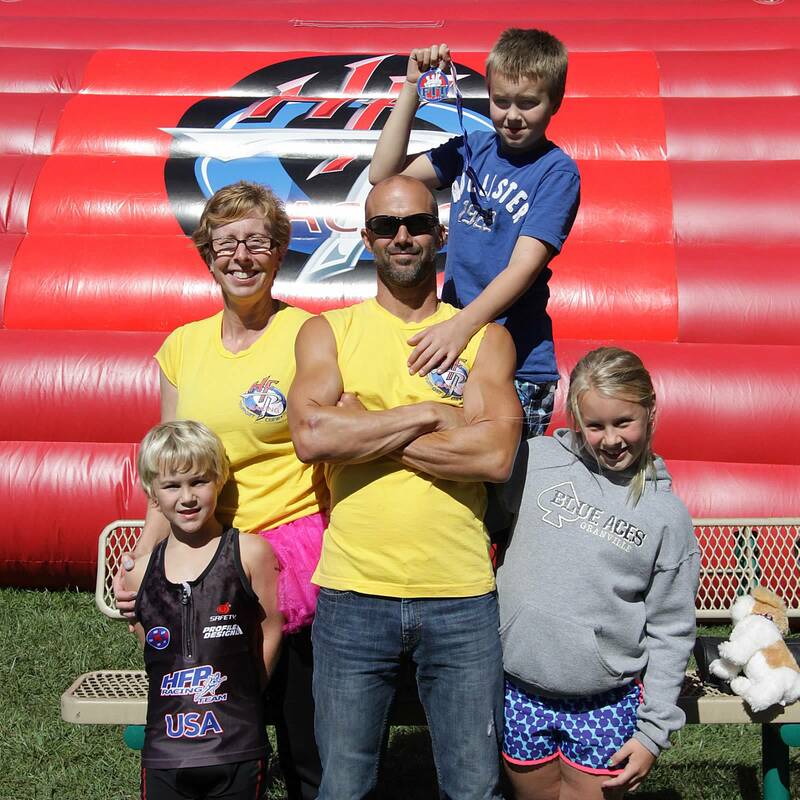 End your racing season on a high note at this outstanding athlete-friendly event. The transition area CLOSES at 8:30am. The half distance triathlon features a 1.2mi 2-lap counter clockwise rectangle swim along the beach, while the duathletes are running an out & back 5k across the Deer Creek dam levy, followed by a 3-lap 56mi bike course through the countryside surrounding the park and finishing with a double out & back 13.1mi run that crosses the Deer Creek dam levy and onto Deer Creek Road to the turnaround before returning for a finish at the park. The half distance bike course will have water & Gatorade in bottles at the end of each 28 mile lap. This aid station is for the half distance only. Please plan accordingly if you’re racing in the shorter races. Out on the run course all races will have water, Infinit Nutrition, Coke, bananas and granola bars at 3 aid station on this out and back run course. Do I have to finish an event within a certain time frame? The bike course closes at 1:30pm. Everyone MUST be off the course at this time. No one will be permitted to start a 3rd lap of the bike after 12:45pm. This is your final communication from HFP Racing before we leave on Friday, September 20 for Morgantown, WV and the Wells Fargo Advisors Mountaineer Triathlon & Duathlon. Please bring any last minute questions or changes to the park with you as our customer service staff will be on location. Not registered yet? We will be taking in person registration at Hazel Ruby McQuain Park from Noon to 6:00pm on Saturday, September 21. Bikers will go out & back in the right hand curb lane from the bike path on to Leeway Street and across the bridge on Route 19. You MUST stay to the far right at all times and pass with caution as bikes will be going in both directions. You MUST stay within the coned off lane during this time. See Lane Closure Layout for this section of the course. *The elite divisions are only for the sprint, Olympic & half distance triathlon or duathlon participants. Those competing in these divisions are not eligible for age group awards. For those who prefer to race one element of the triathlon or duathlon we offer a relay division for our sprint, Olympic & half distance triathlons and duathlons. Relay teams consist of three (3) members (1 swimmer, 1 biker, 1 runner), each member will complete one segment of the race (2 members for duathlon teams). Each team member will exchange their timing chip bracelet at their assigned bike rack. There are NO age groups in this division. All finishers will receive a handsome finisher medal* and the top three in each division will receive custom awards (including relay teams). *Due to the flooding in Colorado we’ve been informed by FedEx our finisher medals will NOT arrive until Monday! Really bad timing…However, all finishers will be sent their medal in the mail next week. Thursday, September 19 will be the 22nd ride of the New Albany COP Thursday ride season @ 6:00pm. The much anticipated Mohican Endurance Festival has finalized the date for 2014. The inaugural 2014 event will be on Sunday, June 22 and feature a Mini, Sprint, Olympic & Half distance triathlon and duathlon. All events will start and finish at the beautiful Mohican Lodge & Conference Center in Perrysville, Ohio. Triathletes will start & finish their swim from the private beach at the Lodge while duathletes will be enjoying an opening run on Lodge roads. Following the opening swim or run participants will take on bike courses that feature the challenging terrain surrounding the Lodge and Mohican State Forest. Participants will finish their epic event with a daunting run along the infamous Mohican Trail alongside the Mohican River featuring breathtaking views of the Mohican State Forest and surrounding areas. Each finisher will receive a coveted Mohican Endurance Festival Finisher belt buckle with the size determined by the distance conquered. The official website (www.MohicanEnduranceFestival.com) will be launched in late October with registration opening shortly thereafter. Due to size limitations at the Mohican Lodge there will be a limit of 500 total participants for this event. We anticipate a very early sell out.